By Rebecca Arnold | March 17, 2019 | This post may contain affiliate links, which means we may receive a small commission, at no cost to you, if you make a purchase through a link. Read our Disclosure. 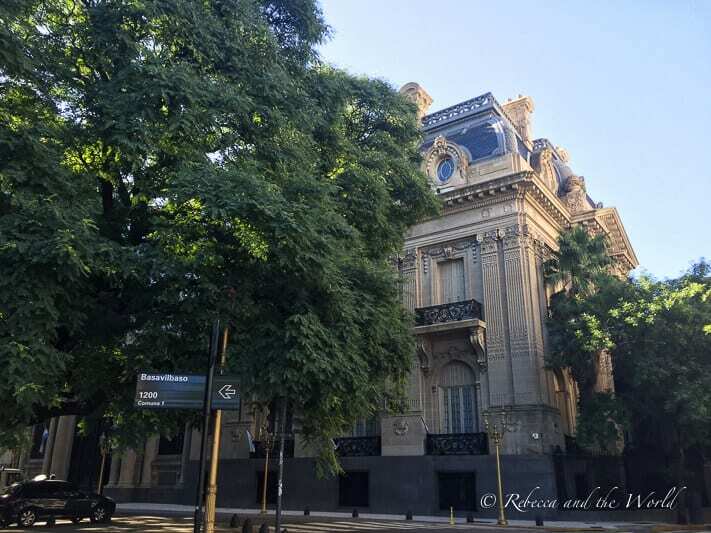 While residents of Buenos Aires spurn the moniker, there’s really no denying that Buenos Aires’ nickname as the “Paris of the South” is fitting – the architecture doesn’t lie. But the most European city of South America, and the Argentine capital is more than that. 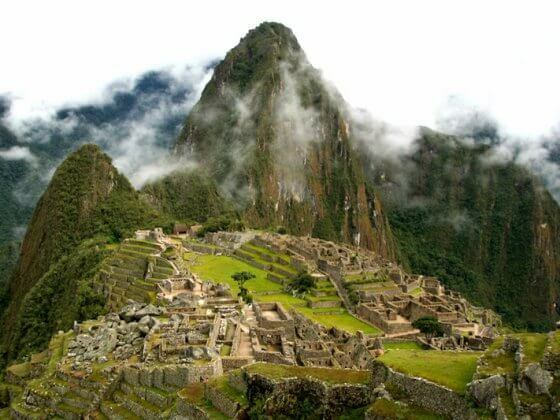 It’s a cosmopolitan city with a clearly defined Latin America twist and is a must-visit on any South America itinerary. If you’re planning to visit Buenos Aires Argentina for the first time, here are a few things you need to know before you land in this whirlwind of a city. This is the sort of Buenos Aires travel guide I would have loved to have had before moving to Buenos Aires! What Is That On My Bill? First things first: after your flights to Buenos Aires, when you land you’re most likely arriving at Ezeiza airport (EZE) which serves international flights. If you’re then heading somewhere domestically within Argentina, you’re probably going to be flying out of Aeroparque Jorge Newbery (AEP). This is important to know if you have a connecting flight upon arrival. Important to know because these two airports are 41 kilometres apart and the trip between the two can take more than two hours in peak-hour traffic, so plan your travels accordingly. This is not a city to breeze through. It’s deserving of at least three days – or even a week! 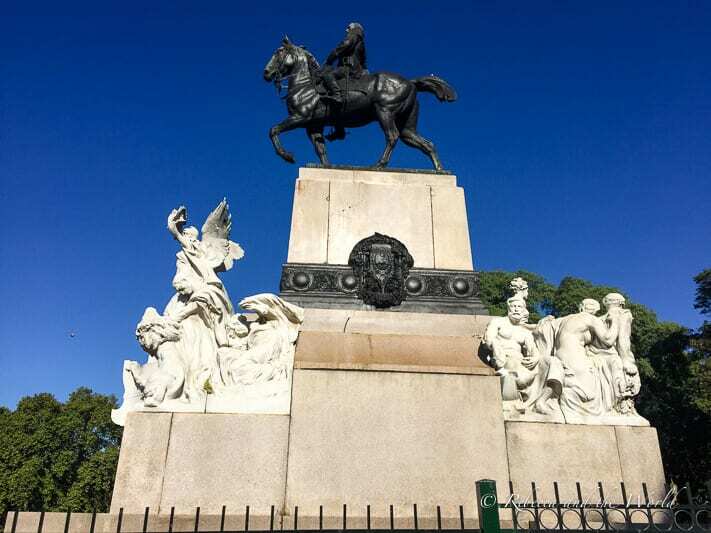 Buenos Aires sightseeing includes museums to see, parks to lounge in, trendy neighborhoods to explore, tango to be danced, and more steak to eat than you can poke a stick at. 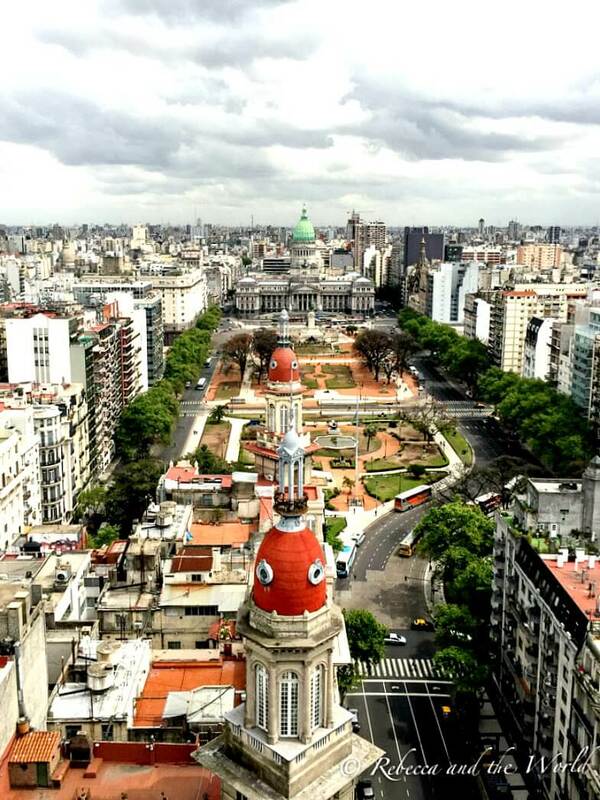 There are so many things to do in Buenos Aires, so plan a few days here. Getting around Buenos Aires is easy – and fairly cheap. Buses will get you to most areas of the city. You’ll need a SUBE card which can be purchased from most kioskos (convenience store) or subte (the metro system) ticket windows. You can’t purchase them on board the bus! Once you have a SUBE card, you’ll be able to ride colectivos (buses), the subte or the aboveground trains (which tend to go to the outer neighborhoods). The Cómo Llego app is handy to check how to get from A to B. Taxis are everywhere – it’s rare to step out on to a street and not have a taxi pull up within a few minutes! Simply raise your arm to hail a taxi. Check a map before you head out, as it’s handy to know the cross streets of where you’re headed to; most taxi drivers use those to navigate. Make sure your driver turns on the meter when you get in. BA Taxi and EasyTaxi are both apps that hail taxis from your phone if you prefer. Argentina’s economy is in a constant state of flux – it’s really hard to keep up with where the peso is going. Prices change regularly and the inflation rate hovers around 40 percent or more. While Argentina can be an affordable destination, some things may be more expensive than expected. If you find yourself complaining, spare a thought for the Argentine’s who work hard but watch their salary stay the same while prices continually creep up. Take cash with you, U.S. dollars or Euros, and have it changed in Argentina! Bring large bills that are free of tears, creases or marks. Ask your hotel for a recommendation for a money changer – they literally stand in some streets but it’s intimidating for a visitor to change money this way! Change your pesos into smaller notes so you have change to use in shops. Credit cards are accepted in hotels and restaurants that are used to tourists, but you’ll find that most places don’t have the infrastructure to accept credit cards or will add a surcharge. So you think your high school Spanish will get you by when you visit Argentina? Think again! Argentine’s speak Spanish, but in Argentina it’s Castellano. You’ll hear vos used instead of tú, and the “ll” sound is more like “zh” that’ll leave you scratching your head. Buena suerte! 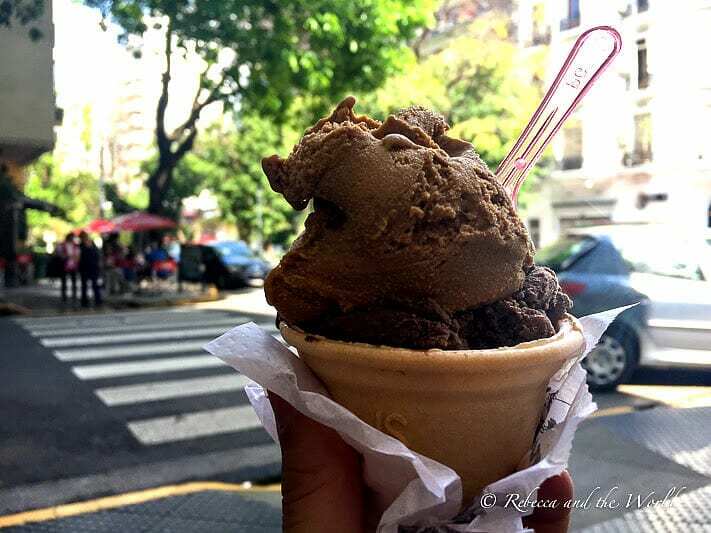 Don’t expect to be eating veggies when you explore the city of Buenos Aires. The closest you’ll get is the salad that’s served at every steakhouse before your steak comes out. Argentine’s eat around 120 pounds of beef each year, which puts them in the number 2 position for consumption of beef (just behind neighboring Uruguay, also a country of meat lovers!). 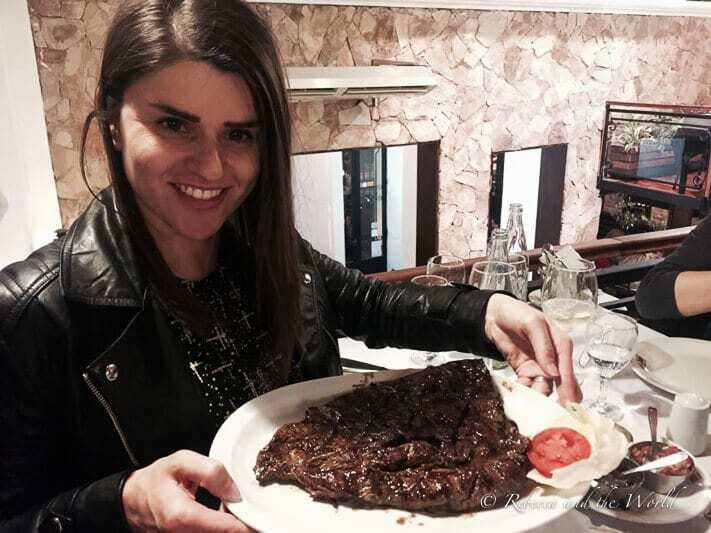 One of the top Buenos Aires things to do is eat some amazing steak. Make sure to visit a parrilla (steakhouse) during your visit. To order steak, you can ask for it jugoso (medium rare), a punto (medium) or bien cocido (well done). Beyond steak, Buenos Aires has restaurants of all cuisines and to suit every budget. I never realised how much I needed ice cream in my life until I lived here. On every corner is an ice cream shop selling the creamiest, most flavorsome ice cream I’ve ever had in my life. The Italian influence in Argentina is to be thanked for this gift. Make sure you try dulce de leche flavour, a creamy caramel. My favorite ice cream shop is Rapa Nui (address: Uruguay 1284) where you will be overwhelmed with the amazing flavors for sale. Freddo and Volta are chain stores which are all across the city. When you get your bill (la cuenta) at the end of a meal, you may wonder what a few charges are. The cubierto is not a tip – it’s actually a small charge to cover bread and the cutlery you’ve used. While it’s old fashioned, you’ll find it on the bill in most restaurants. Tipping isn’t usually expected but 10 percent is pretty common. North Americans may find it strange that water isn’t free – you will pay for sparkling (con gas) or still (sin gas) water, but it’s quite cheap. 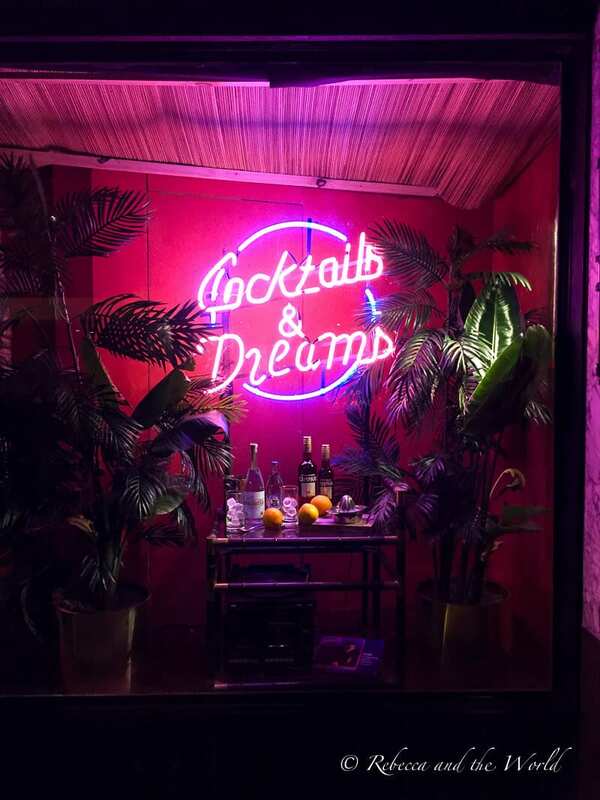 While Argentina may be rightly famous for wine, it’s worth checking out a few of the city’s secret cocktail bars – some of which require James Bond-style methods to get in to. At Frank’s Bar (Arévalo 1445), the race is on to crack a few codes, the final one of which you’ll need to enter into a phone booth to reveal the bar. Florería Atlántico (Arroyo 872) is a popular bar, which can only be entered through a huge refrigerator door inside a florist shop. At Victoria Brown (Costa Rica 4827), you’ll need to find the door to get into the bar (spoiler: push the brick wall at the back of the café, it’s actually the door!). Make sure to try fernet, a bitter liqueur usually served mixed with Coca-Cola. It’s a bit medicinal tasting for me, but when in Rome! If you’re usually in bed by 9 p.m. then you’re in for a shock – people are barely even heading out for dinner at that time! Restaurants in Buenos Aires start filling up between 9 and 11 p.m. (and later) and it’s easy to tell who the tourists are by walking past a restaurant at 7 p.m. If you’re up for some Buenos Aires nightlife, you’ll need a nap to get you ready – nightclubs and bars aren’t really happening until 2 a.m.! In the land of beef, of course there’s leather. You can have a leather jacket custom made in only a few days. Bring a picture of something you like, have your measurements taken and voilà, you’ll be taking home a stylish souvenir. If a leather jacket isn’t what you’re after, you can have something else made: skirt, boots, overnight bag, gloves – anything you want, really. This is generally a safe city, but like most major cities, it’s best to be aware of your surroundings at all times. The city isn’t immune to petty theft and pick pocketing does occur – it happened to me and those guys are fast! Also be careful inside taxis if you have the windows down or while walking along the street – thieves do come by on motorbikes to steal items right out of your hands. Never leave your mobile phone or handbag on a table or on the back of your chair in a restaurant – the thieves are so good here they’ve even been known to steal from right under the Secret Service’s nose! Having said that, if you’re sensible you’ll have no troubles in Buenos Aires. While you can visit Buenos Aires year-round, spring is the best time to come. 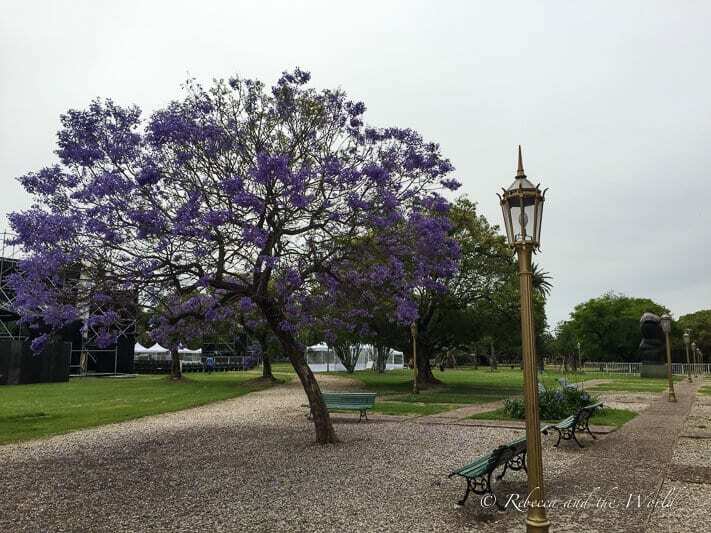 The weather is milder and the jacarandas that line the wide boulevards are in full bloom – it’s a beautiful sight. Summers are hot and humid so prepare to be sweaty. There are plenty of parks, however, to cool off in. Keep in mind that Christmas and New Year are times to be with family, so you’ll find the city to be quieter than at other times. I was surprised to find that there was no wild New Year’s Eve party given porteños’ propensity for a good time! There’s no snow, but winters in Buenos Aires can be miserably cold and rainy. Still, it’s not a bad time to visit the city if you can stand the weather. There are many trendy barrios (neighborhoods) to stay in Buenos Aires. Palermo is made up of many smaller barrios and you’re most likely to end up here at some point. If you like restaurants, nightlife and shopping, Palermo is where you’ll be right in the thick of it. 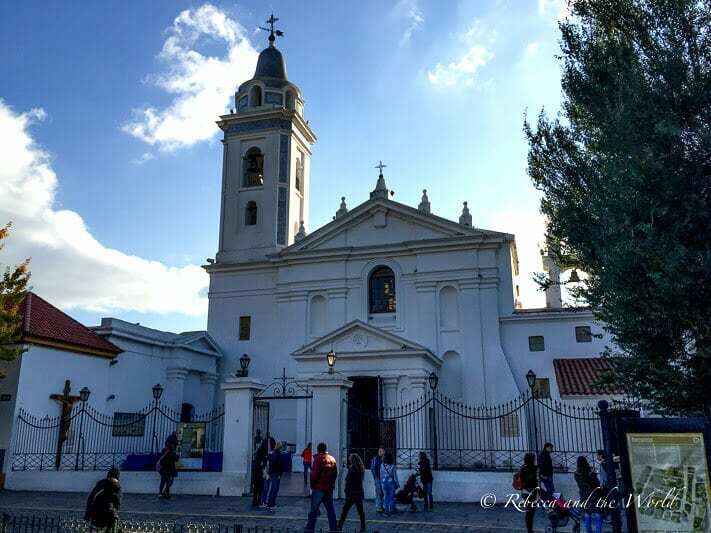 Recoleta is one of Buenos Aires’ most elegant neighborhoods, lined with luxury stores and ornate statues. It’s a quiet neighborhood but there’s still plenty to do here. It’s also home to some of the most popular Buenos Aires attractions, including Recoleta Cemetery, Museo Nacional de Bellas Artes and El Ateneo Grand Splendid bookstore (inside an old theatre). 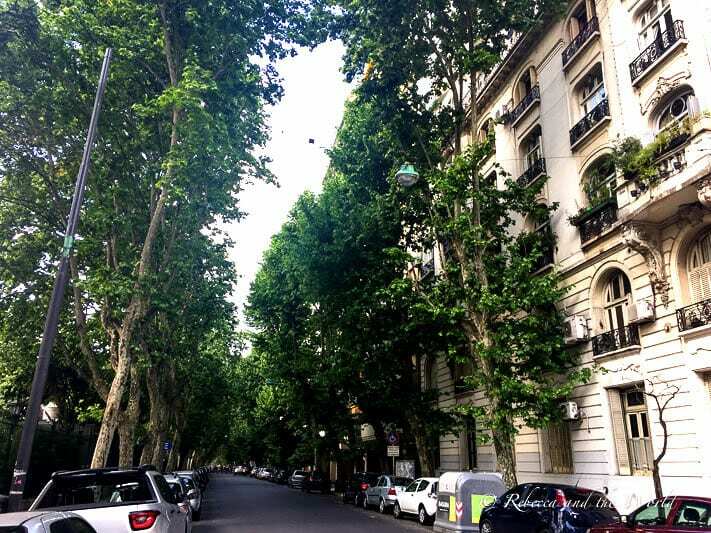 This is the neighborhood I lived in when I lived in Buenos Aires. Every Sunday, San Telmo hosts the bustling San Telmo Market, a huge street fair over dozens of blocks. For the rest of the week, the barrio is a tranquil and interesting place to stay, with its cobblestoned streets and historic buildings. There are so many beautiful buildings, you may find yourself constantly looking up in awe. 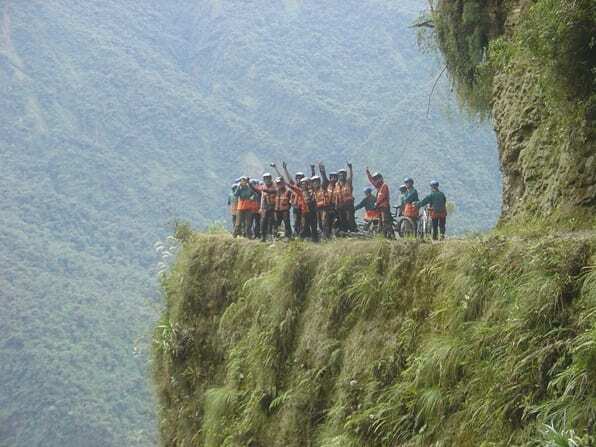 But make sure you keep an eye on the footpath as well! Porteños don’t seem to be that good at picking up after their dogs, so it’s inevitable that you’ll step in some dog sh*t at some point during your trip! For the top hotels in Buenos Aires check out the options through our partner, Booking.com. We find they have the widest range of properties. You get free cancellation on most rooms, a best price guarantee, and they have verified reviews from guests who have actually stayed at the property! A good mid-range option is Republica Palermo in Palermo Soho. If you want something more luxurious but still good value, consider Own Hotel in Palermo Soho or Casa Calma in Recoleta. Super-luxury travelers will be thrilled by world-renowned options such as the Alvear Palace Hotel and the Faena Hotel + Universe. If you fancy a home and living like a local, or have a large family or traveling with a group of friends, consider Airbnb. They can be a better option than booking several hotel rooms. 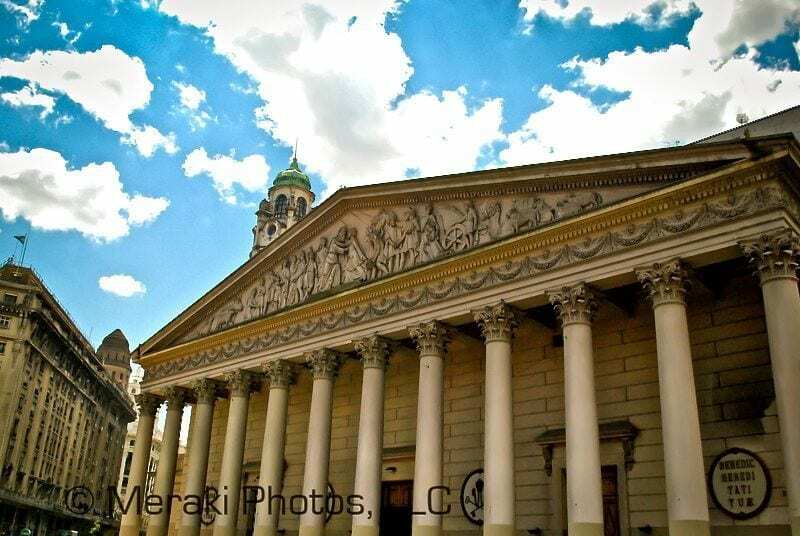 Find the best Buenos Aires tours and attractions with our preferred partner, Get Your Guide. Do you have any questions about visiting Buenos Aires? 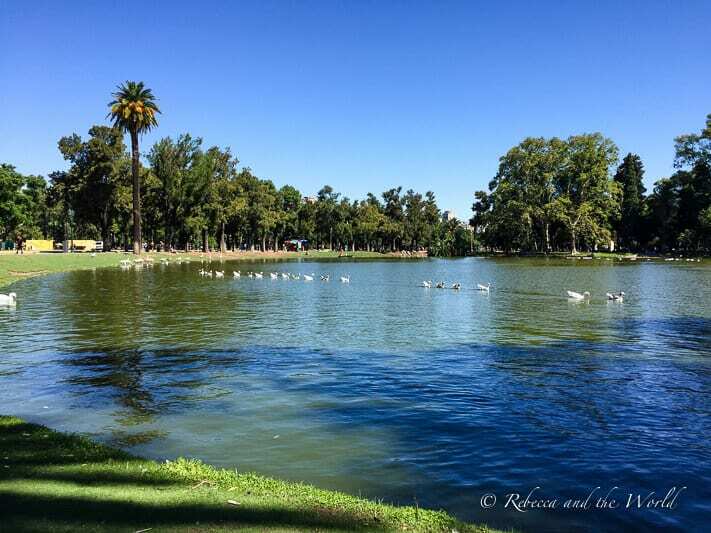 Or have any of your own tips on what to do in Buenos Aires? Share in the comments below!